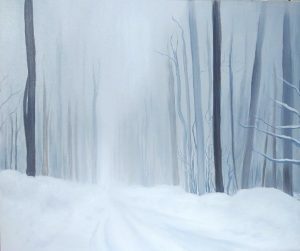 I am ending this 30 paintings in 30 days challenge with a winter tree series. It takes me back to my textile design days creating varigated stripes combined with my memeories of winter. Be sure to subscribe to my newsletter for upcoming art exhibit events and sales of my artwork from this challenge and more. Thanks for following along this past month. Sandra Mucha Art Studio – Newsletter Sign up.